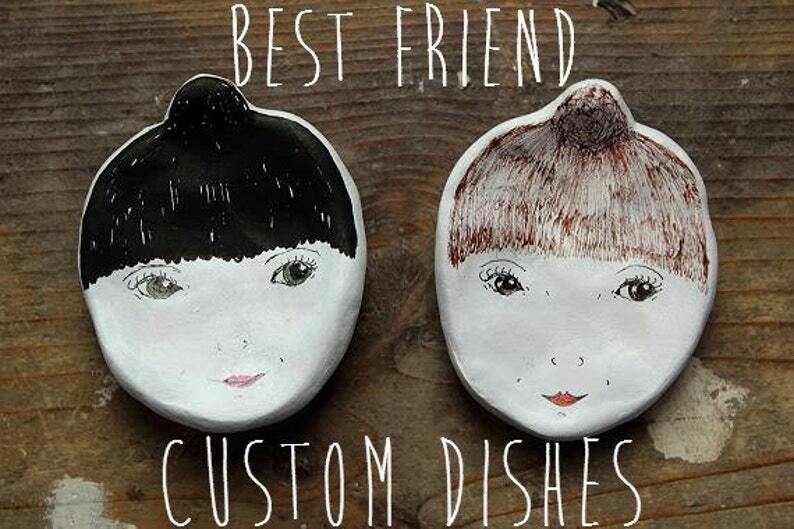 Custom Small Best Friend Face Dishes. Bespoke/Personalised. Great unique/quirky gift. BF, Friend, Sister. This listing is for two custom best friend face dishes! You can choose the hair colour, eye colour, particular features, accessories etc. Alternatively send me a photo of you and your chum and I will interpret you both myself! The cost is just £17.50 for two! These make fab, unique little gifts for birthdays, anniversaries, special occasions. Give both as a gift, keep for yourself or keep one and give the other to a friend as a cute reminder of each other. They are all handmade and hand painted/hand drawn by myself using quality materials. Perfect to use as jewellery/trinket dishes but they are not waterproof so unsuitable for use with food or drink. Custom Face Dish. Choose Hair colour, features, accessories.Bespoke/ Personalised. Great unique/quirky Gift. This was the perfect gift for my best friend. We both were impressed with the likeness. Very cute!